Bill Caudill was born in Hobart in 1914 and moved to Durant then OKC, where he grew up and graduated from Central High School in 1932. After high school, he attended OSU and graduated in 1937 while also earning the title, Outstanding Male Graduate. He worked in Stillwater for a year then applied for and received a scholarship to MIT, where he earned his Master’s in 1939. Caudill then headed to Texas A&M in College Station to teach and work on a book about school planning called Space for Teaching: An Approach to the Design of Elementary Schools for Texas. In the book, Caudill campaigned for a new kind of school, one that would be thoroughly modern, inviting, and flexible by fulfilling a variety of needs for students and community alike. Before he could put his school theories into practice, however, WWII broke out, putting all building on hold for the duration. Caudill enlisted and worked for the U.S. Army Corps of Engineers throughout the war. 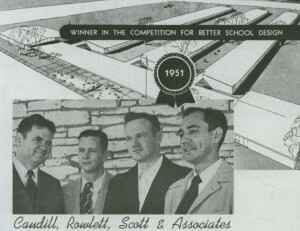 After the end of hostilities, he and fellow Texas A&M teacher, John Rowlett (who graduated from UT), decided to form their own firm while still working as teachers at the university. Soon, they invited Wallie Scott then William Pena to join them, and the group began their practice together designing affordable housing in Warr Acres and putting Caudill’s modern school theories into practice in Blackwell. Once the schools were completed, Caudill and his crew were so happy with the results that they contacted L.A.-based architectural photographer, Julius Shulman, and asked him to come to Oklahoma to photograph them … photos that they hoped would find their way into national publications thanks to the Shulman name. They dished out a “fortune” to the photographer, but the expenditure was well worth it. Shulman’s photos of the Blackwell schools appeared on the cover of Collier’s magazine in September 1950 and in other national publications after that. In fact, the open, airy schools featured in these publications were so popular and highly praised that school board members from districts throughout the nation soon came a’calling and asking for new schools in their areas. Within a few years, the firm was known as THE place to go for school design and the company quickly grew and opened a branch office in Oklahoma City. CRS continued to grow throughout the decades and became internationally recognized as a top-tier firm in the U.S.
As for the original players, Caudill lectured throughout the country, wrote 12 books, and accepted numerous awards for his firm’s work. In addition, he was an AIA Fellow and was admitted to OSU’s College of Engineering Architecture and Technology Hall of Fame in 1964 and received the AIA Gold Medal in 1985. He died in 1983. John Rowlett died in 1978 and Wallie Scott died in 1989.